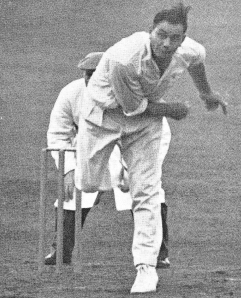 Sir Alec Bedser who died today was sent to France in November 1939. From there he went to the Belgian border, then south of Dunkirk. After that, North Africa and Italy. Cricket lovers should be grateful that he survived those years. He told Nagraj Gollapudi that ‘the main thing in cricket was that you can’t be selfish, that you have got to play for the team.’ Was it the war that had taught him this? Bedser worked hard at his game. His action gave him a natural in-swing, but practice helped him to develop late swing. His size and strength, large hands and powerful fingers, helped him bowl the heavy ball that jarred the batsmen’s hands, but practice gave him a devastating leg cutter. He practiced in the middle, bowling over a thousand overs a season with the wicket-keeper standing up – Macintyre for Surrey and later Godfrey Evans for England. He was both spearhead and stock bowler. Despite losing those years to the war ‘The Big Fella’ played in 51 Tests and took 236 wickets, helping memorably to regain the Ashes in 1953. The highlight was ‘Bedser’s Test’ at Trent Bridge during that season when in Australia’s first innings of 249 he took 7 for 55 in 38.3 overs with 16 maidens and in their second innings of 123 he took 7 for 44 in 17,2 overs with 7 maidens. That year he bowled more than 1200 overs and took 162 wickets, including 39 against Australia. All told he claimed the Don’s wicket six times, but not without working hard on his ‘leg break’ to do so. Sir Alec had an identical twin, Eric. They were very close and even had a joint bank account. When he was invited on tours, Eric would accompany him. In the 46-47 trip Alec lost a good deal of weight as a result of very long bowling spells in gruelling heat. The story goes that when Eric stood on the scales he’d lost exactly the same amount of weight, in sympathy. There were many young men for whom the war removed the chance to develop their cricketing talents. However talented, it could not have been easy for these very young men to return to take up a game after war service had cruelly robbed them of time and comrades and peace of mind. What else did cricket teach him? asked Gollapudi.